It is very important to keep up the momentum of our focus on the “Year of St. Joseph Vaz” throughout this year. I am confident that you have already done the needful to make our Religious and faithful aware of the importance of this year for a deep renewal of our faith commitment and the need to become holy and fervent missionaries with a sense of commitment. Therefore, I urge all of you to make constant reference to different aspects of the life and mission of St. Joseph Vaz in your Sunday homilies and on all other important occasions. Please make available in your parishes and Institutions, literature on our beloved Apostle, to our faithful. Also in different fora such as Parish council meetings, at meetings of associations and movements of our parishes, the call to holiness and the missionary dimension of our Baptismal calling has to be emphasized. Now that the CD with prayer, Litany and hymns on St. Joseph Vaz,is made available to you in the two local languages, please make ample use of it before and after Mass to keep alive the need to constantly implement the suggestions I have given to observe this year meaningfully ,in my pastoral letter. We are marking the 69th anniversary of our independence on the 4th February which is also the Solemnity of Our Lady of Lanka. We thank God on this occasion for our beloved country and the blessings that we have received. We are also conscious of the confused situation in the current political arena. The good governance, ushered in on the 8th of January last year, and the subsequent general election results, has been marred by allegations of massive corruption as in the case of the Treasury bond-scam. What is difficult to comprehend is that while the whole country is aware that there has been an instance of massive corruption, the powers that be, have been very slow to investigate the allegations and take measures to bring to book those who are guilty and restore to the country the massive loss incurred. We are celebrating independence when we have been rated as the 93rd country in the list of corruption. We must encourage our faithful at what ever the level they are engaged in civil affairs, to be honest and transparent and be committed to their tasks. If we are to leave behind a country that is worthwhile living in, to our future generations, it is our sacred duty to raise our voice against corruption in all its forms. It is with great joy that we announce the Priestly ordination of our two Deacons to be held at St. Anthony’s Cathedral, Kandy on the 27th February 2017 at 3.00 p.m. Please keep our two Deacons, Leonard Wijeratne and Malith Prasad, in your prayers specially during this month. The blessing of the Shrine of St. Joseph Vaz in the Parish of Nanu Oya will take place on the 10th February which is a public, Bank and Mercantile holiday. I hope that our Clergy, specially the Priests and Religious of Nuwara Eliya vicariate and some representatives from each of the Parishes of the vicariate will attend this important event as this will be the primary Shrine dedicated to our beloved Apostle in upcountry. 27th & 28th – Clergy Monthly Recollection at Fatima Retreat House, Lewella. Deacon S.G. Leonard Wijerathne was born on the 10th May 1988 in NIkewehara . He is the son of Mr & Mrs S.G. Simon Wijerathne and he is the youngest in the family. He did his preliminary studies at Nikewehera Viduhala and after completing his G.C.E O/L examinations he joined St. Joseph’s Minor Seminary on the 26th January 2005. in the year 2009 he entered the Intermediate Seminary, Kalutara. after the formation at the Daham Sevena he began his major seminary formation in 2010 and he completed his Philosophical and Theological studies in 2016. He was ordained a Deacon on the 8th January 2017 at St. Joseph’s Minor Seminary, by His Lordship Bishop Vianney Fernando and he will be ordained a Priest on the 27th February 2017 at St. Anthony’s Cathedral, Kandy. Deacon S.M. Malith Prasad was born on the 4th January 1990 in Kandathoduwawa. He is the son of S.M. Anthony Joseph and D. Mallika Jayanthi and he is he second child in the family. He went to Pulkandalaya Government Sinhala School for his primary education. Then he entered the Minor Seminary on the 28th May 2006. After the Minor Seminary formation he entered the Intermediate Seminary on the 14th Oct 2009. He started his major Seminary on the 23rd September to do his both Philosophical and Theological studies. He was ordained a Deacon on the 8th January 2017 at St. Joseph’s Minor Seminary, by His Lordship Bishop Vianney Fernando and he will be ordained a Priest on the 27th February 2017 at St. Anthony’s Cathedral, Kandy. Grace and Peace from God our Father and the Lord Jesus Christ! As you are already aware the year 2017 is the year dedicated to St. Joseph Vaz, the Apostle of Sri Lanka. 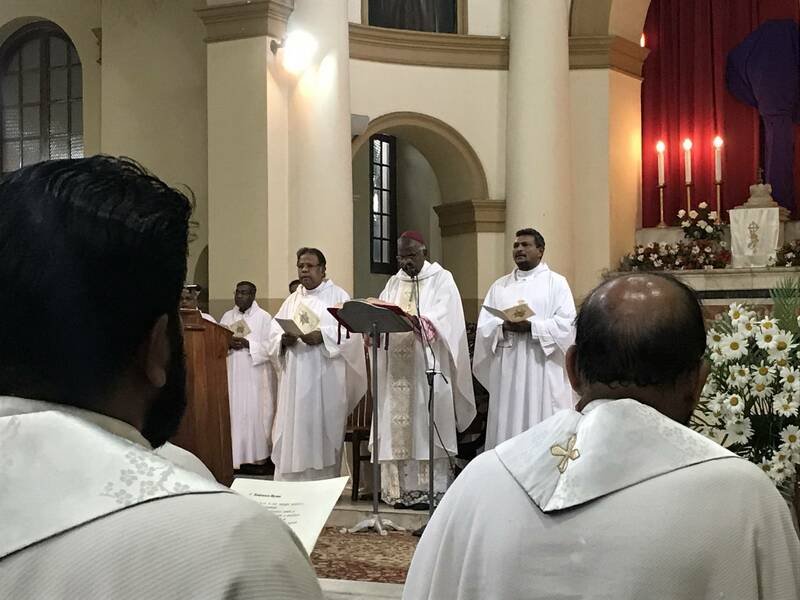 The pastoral letter of Catholic Bishops’ Conference of Sri Lanka has already been released. It spells out the objectives of declaring a year dedicated to St. Joseph Vaz. It is very important that in view of a deep renewal of our baptismal calling, we come to know this greatest missionary that the Church in Asia has produced. Please study the Pastoral Letter of CBCSL carefully, personally as well as in Religious Communities and in Parish Councils and Catholic Movements and Associations. In the unbelievable Saga of the missionary adventures of St.Joseph Vaz we discover that the secret of success in his missionary endeavors has been his heroic sanctity and burning missionary zeal. Therefore, in this year we must be convinced of the universal call to holiness by virtue of our baptismal consecration “Be perfect as your heavenly Father is perfect” St. Mathew 5 : 48 ). His heroic sanctity was rooted in prayer and asceticism as well as his indomitable faith in the unfailing providence of God. He was able to overcome seemingly impossible challenges and difficulties because of his deep spirituality. Let us strive therefore, as individuals, families, Religious communities and parish communities to be deeply renewed in our faith commitment and journey towards holiness through prayer (personal and liturgical) with greater fervor and love. The missionary methods that St. Joseph Vaz used to rekindle the dying faith of our forefathers must be focused upon and emulated by everyone in our Diocese namely men, women and children. St. Joseph Vaz’s life was characterized by simplicity, asceticism, humility and a closeness to people. He took on the life style of the ordinary people. he slept on the ground and spoke the languages of his flock. His availability day and night to the scattered flock was exemplary. He visited all his priests and the Catholic communities every year. His charity whether it be during the small pox epidemic in Kandy or in his daily relationship with his flock was truly exemplary. He left a bag of rice every day at the Church door in Kandy for the poor people to help themselves. He had no earthly resources but depended solely on divine providence for his sustenance and missionary work. He was a man of communion who related to everyone from the king to other Religious leaders even to the humblest and poorest. This was a great missionary asset in the work of St. Joseph Vaz. His Pastoral visits to his scattered flock and individual families as well as the sick and aged, is a great model for us to follow. St. Joseph Vaz never gave up pursuing the apostates and fallen away Catholics even when they were persistently refusing to heed his appeals and return to the fold. Many are the instances in his life when finally, the fallen away were touched by divine grace and by his humility and returned to the flock and become fervent Catholics. St. Joseph Vaz knew the importance of the Holy Mass for building up the community. For the first ten years he was the only priest in the country and he went about celebrating the Eucharist and organizing small Christian communities with lay leaders to look after them. It is St. Joseph Vaz who devised the missionary method of nourishing the faithful on Sundays with the “Puja Dhyanaya” or the meditative liturgy of the Word, when a priest was not available to celebrate the Sunday Mass in the scattered communities. St. Joseph Vaz’s closest lay collaborator for 24 years was a lay man namely his servant John. He prayed with him, he taught him Christian doctrine and made him a fervent lay Apostle. This year we must present John as a model for the Lay Apostolate, as he collaborated closely with St. Joseph Vaz in his untiring missionary labours. St. Joseph Vaz was the founder of the first ever Religious Institute founded in Asia namely the Oratory of St. Philip Neri of Goa. It is this Institute that supplied priests for the whole duration of 150 years during the Dutch persecution of Catholics in our country. Those in consecrated life in our Diocese namely all the apostolic congregations should take St. Joseph Vaz as their model and exemplar for a deeper missionary spirituality in living out the charisms of their different Religious congregations, serving in our Diocese. Thus renewed in our faith and our Christian commitment as well as Priestly and Religious calling we are called to strive to become a truly participatory and an evangelizing Church in our Diocese. For this we need to collaborate with one another as brothers and sisters of one family without any vested interests, if we are to achieve the objectives of the year of St. Joseph Vaz. As your Chief Shepherd, I. therefore exhort you and beg of you to do your utmost in working selflessly for the kingdom of God to be established in our beautiful Diocese among our simple faithful through a deep spirituality in striving for holiness being inspired by the successful missionary methods of our beloved Apostle, St. Joseph Vaz. Please note that these proposals are not exhaustive. Therefore, all parish priests and heads of Institutions are expected to obtain the views of all engaged in the pastoral ministry to come up with creative and innovative ways and means of making this grace-filled year, truly fruitful in building up a mission–oriented Catholic Community in our Diocese. It is only by striving for heroic sanctity following the example of our beloved Apostle, that this can be done. 1. A Diocesan Mission Team with all the Diocesan Directors and coordinators of different Apostolates in our Diocese will be formed to supervise all the activities of the Year of St. Joseph Vaz. The Bishop will chair the Mission Team meetings. The convener shall be the Vicar General. 3. On 12 selected themes a monthly level prayer service to be organized in the Parish Churches, Mission Stations and Small Christian Communities. 4. Organize in every Parish and mission station a stall to make available materials such as biographies of St. Joseph Vaz in Tamil, Sinhala and English as well as Novenas and prayer Cards with the litany etc. after every Sunday Mass. 5. Organize seminars and study days on the life and missionary methods of St. Joseph Vaz for different categories of faithful, lay organizations, Movements, youth, catechists, adults and children. 7. The catechetical Apostolate at diocesan and parish level shall organize competitions such as Art, Essays and speech for Sunday school children under different themes on St. Joseph Vaz. The leadership will be taken by the diocesan Director and the coordinators. The Diocesan Catechetical Centre will organize 12 lessons under 12 themes for the Sunday School syllabus. The children will spend a minimum of 01 hour every month for this lesson. 8. In the celebration of different diocesan and parish level events such as Novenas in preparation for Church feasts, different themes such as the heroic sanctity and missionary zeal of St.Joseph Vaz and missionary methods should be given emphasis. In the Pontifical Societies Calendar too, such themes on this great missionary, should be focused upon for the instruction of the faithful and the children. Organize in all the parishes St. Joseph Vaz Associations (where these are already available revitalize them) in view of the the laity undertaking various charitable activities such as visiting the sick and the lapsed Catholics, those in mixed marriages as well as caring for the poor in the parish communities. St. Joseph Vaz Associations in every parish should be encouraged to organize mini- income generating programmes at parish level such as sale of garden products, used clothing etc to raise funds to help the poor. 11. A statue of St, Joseph Vaz like our Blessed Mother Mary’s statue taken for Marian devotion, to be taken around to the homes of the parish for the purpose of revitalizing the commitment of the family to live like the Holy Family of Nazareth. In this venture all the lay leaders, those in consecrated life in our parishes and the parish Clergy should be fully involved. 12. Family days to be organized with talks and seminars on St. Joseph Vaz and his outstanding holiness and pastoral zeal. Let us therefore, enter into the spirit of this year with zeal and enthusiasm, so that our diocese will grow from strength to strength to be truly a participatory and an evangelizing church. I exhort all parish Priests to ensure that this pastoral letter is read in all Parish Churches and all outstations and Institutions, within the Parish, to make our faithful aware that this year is the year of St, Joseph Vaz and to call for a true ” change of heart” in all of us. The prayer for the Year of St. Joseph Vaz, shall be recited by the Celebrant and the faithful after every holy Mass, and a popular hymn to St. Joseph Vaz shall be sung at the end of all Holy Masses. St. Joseph Vaz, the beloved apostle of our Motherland. and may our families become holy, like the Holy Family of Nazareth. 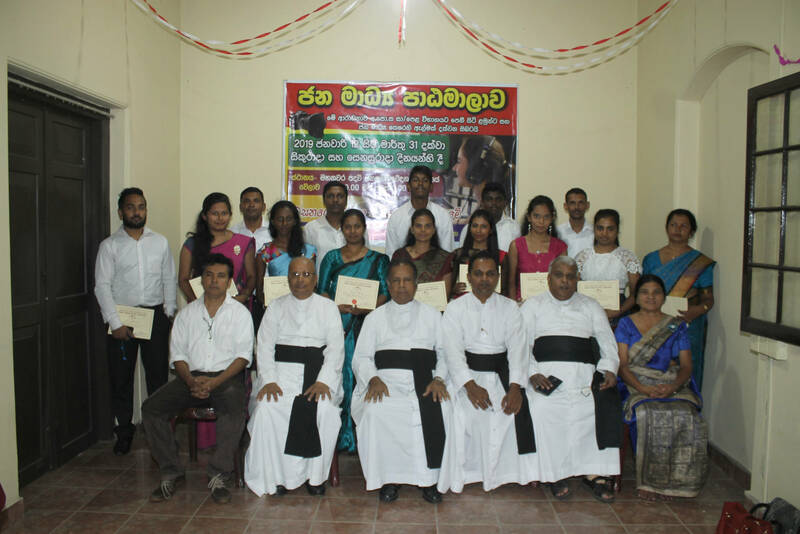 an evangelising Church in Sri Lanka. who lives and reigns with You for ever and ever! Our Lady of Lanka – Pray for us! St. Joseph Vaz – Pray for us! During his homily in the Chapel of Santa Marta, Pope Francis said that authentic faith must be ready to take risks and that real hope is the reward. Commenting on the Gospel account of the paralytic who is lowered from the roof of the house where Jesus is teaching, the Pope said people follow Jesus out of self interest or because they are looking for a comforting word. Even if no intention is totally pure or perfect, he said, the important thing is to follow Jesus. People were drawn to Him because of the “things He said and the way he said them. They understood Him. He healed them and many people followed Him to be healed”. There were times, said Pope Francis, when Jesus admonished people who were more interested in their own well-being than in the Word of God. There were other times, continued the Pope, when people wanted to make Jesus King, thinking He was “the perfect politician!”. But they were wrong and Jesus “went away and hid”. Even so, the Lord let anyone follow Him because He knew that we are all sinners. The bigger problem, confirmed the Pope, “was not with those who followed Jesus”, but with those who stayed where they were. “Those who didn’t move…and watched. They were sitting down…watching from the balcony. Their life was not a journey: their life was a balcony! From there they never took risks. They just judged. They were pure and wouldn’t get involved. But their judgements were severe. In their hearts they said: What ignorant people! What superstitious people! How often, when we see the piety of simple people, are we too subject to that clericalism that hurts the Church so much”. Reflecting on those who don’t move in their lives, Pope Francis referenced the man who “sat beside the pool for 38 years, without moving, embittered by life, without hope…someone else who failed to follow Jesus and had no hope”. But those who did follow Jesus, continued the Pope, were ready to risk in order to meet Him, in order to “find what they wanted”. Going back to the day’s Gospel reading, Pope Francis said “the men who made a hole in the roof took a risk”. They risked the owner of the house suing them and taking them to court to pay for the damages. They were ready to risk because “they wanted to go to Jesus”. The woman who was sick took a risk when she furtively touched the hem of Jesus’ cloak: she risked being ridiculed. But she risked: because she wanted to be cured, “she wanted to reach Jesus. Remember the Canaanite woman: women risk more than men do! That’s true: they are better at it! We have to admit that”. Following Jesus, the Pope went on, “isn’t easy, but it’s wonderful! And it’s always a risk”. There are times, he said, when we risk “being ridiculous”. But we achieve what counts: “our sins are forgiven”. Beneath whatever request we are making, whether it be for good health or for a solution to a problem, “there’s the desire to be healed in spirit, to be forgiven”. All of us know we are sinners, said Pope Francis, “and that’s why we follow Jesus: to meet Him. So we take risks”. Let’s ask ourselves, concluded Pope Francis: “Do I take risks, or do I follow Jesus according to the rules of my insurance company?” Because “that’s not the way to follow Jesus. That way you don’t move, like those who judge”. Do we follow Jesus because we need something, or do we follow Him because we are ready to risk? “This is faith: trusting in Jesus, having faith in Jesus. And with this faith in Him, these men cut a hole in the roof and lowered the stretcher down in front of Jesus so he could cure the sick man”. “Do I put my faith in Jesus?”, asked the Pope. “Do I entrust my life to Jesus? Am I walking behind Jesus even if sometimes I seem ridiculous? Or am I sitting still, watching what others are doing?” Am I watching life with a soul that is static, “with a soul that is closed with bitterness and lack of hope? We should each be asking ourselves these questions today”. Listening to others requires a lot of vulnerability, personal inner work, and prayer. As compassionate listeners, we accept others exactly where they are and honour the wealth of their lived experience by hearing their stories. Listening is a skill. Like any skill, if we have the desire to improve and practice, we will get better. Pray for the ability to listen with the heart of Jesus. When I listen to someone, do I really want to hear what they have to say? When I visit with someone, do I talk more than I listen? When I listen to someone, am I preoccupied with what I am going to say next? Do I bring a spirit of optimism and calmness to each person that I listen to? Is my body language attentive – do I let the person know that I am glad to be spending time with her/him? Do I feel frustrated when I cannot give advice? Can I set my judgments aside to listen to the story of the other? Am I comfortable with silence to allow the other person time to ponder what they would like to discuss? Am I discovering that if I listen attentively, people open up to me at deeper levels? Do I pray for guidance before pastorally visiting with someone? Pastoral listening is both a blessing to those we visit and a blessing for each of us in ways that we could never imagine. When we listen well, we invite the sacred and a place for hope. Think of someone who has truly listened to you? Why did you choose that person to talk with? What qualities did they have? How did you know that they were really listening to you? Is listening more than hearing? Does listening have anything to do with compassion? In what ways might you strengthen your listening skills? Pope Francis on Thursday invited the faithful to let themselves be drawn by Jesus pointing out that Christian life is a daily struggle against temptation.The Pope warned against the temptations that lead us down the wrong path.Referring to the Gospel reading of the day, Pope Francis said Jesus came to destroy the influence of evil on our hearts. So much so, Francis said, Jesus told his disciples to have a boat ready for him because of the crowd, so that they would not crush him. And he said He too was moved because he saw these people as sheep without a shepherd, and thanks to the action of the Holy Spirit the Father was drawing them to the Lord. And, the Pope emphasized, the reason for which so many people were attracted by Jesus Christ was nothing to do with Apologetics. Those, he said, who feel they are very Catholic and never have temptations, must pray because they are on the wrong path. “A Christian life without temptations is not Christian, he said: it is ideological, it is Gnostic, but it is not Christian”. When the Father draws people to Jesus, Pope Francis explained, there is an opposite force that causes conflict. “That’s why St Paul speaks of Christian life as a struggle: a daily struggle. A fight!” he said: That’s why Jesus came: “to destroy Satan’s empire, the empire of evil”. He came to destroy its influence in our hearts, the Pope said. So while the Father is attracting you to Jesus, the spirit of evil is seeking to destroy that attraction. The Pope concluded with the exhortation to fight on and feel the heart that struggles for the victory of Jesus. “May the Lord give us the grace to know how to discern what is going on in our hearts and to choose the right path upon which the Father draws us to Jesus” he said.